To celebrate breaking the 400 mark and to almost be at 500 likes on Facebook I wanted to have a giveaway! 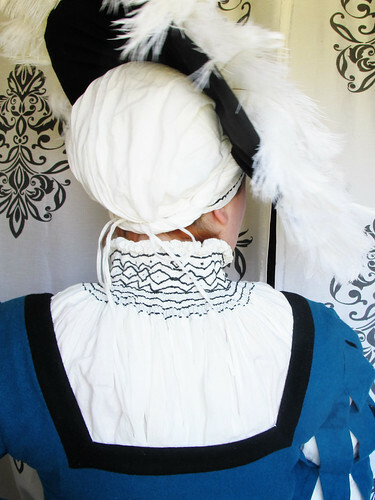 So I have made a new frilled veil, just like the one in the picture that I want to give to one of you. Anyone can enter; I will ship to anywhere on the planet! All you have to do is to comment this picture on my Facebook and tell me how you found me. One comment nothing more! I will draw one name randomly next Sunday the 7 of October and announce the winner on Facebook. Remember to comment on Facebook, a comment here s not counted as an entry. 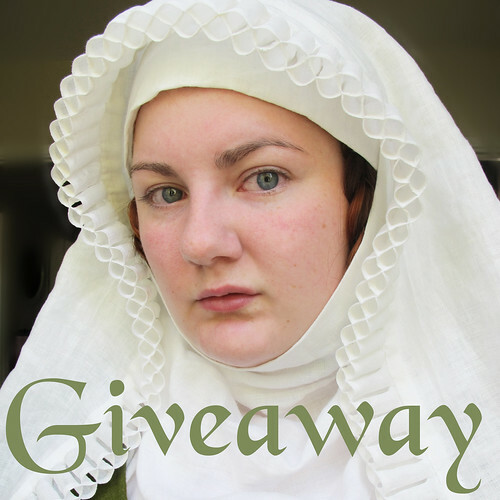 4 Comments Frilled veil giveaway! 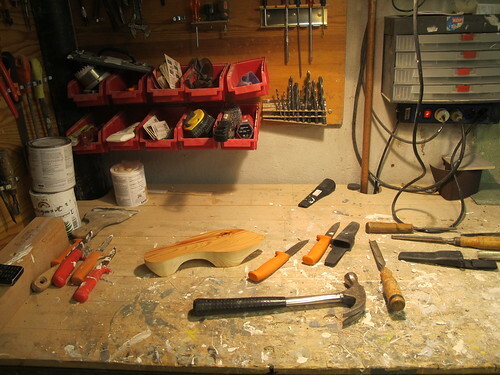 I like the extra things and sometimes I rather make a “unnecessary thing” than something that I would actually need. 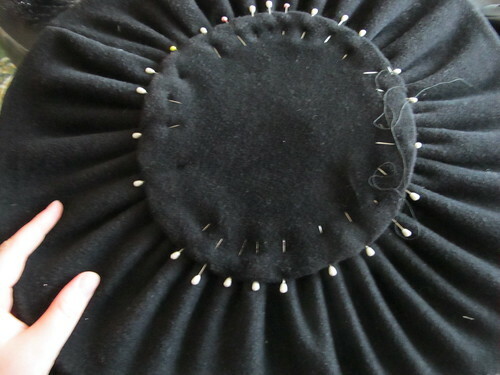 Well of course pattens are not really unnecessary, they are really useful thing to have in bad weather, but to make them for a summer event when you live in a apartment might see a bit unnecessary, at least to make them before you start a new dress that you needed. But sometimes I can not help myself, I see a thing and then I need it. When I need something I make it! 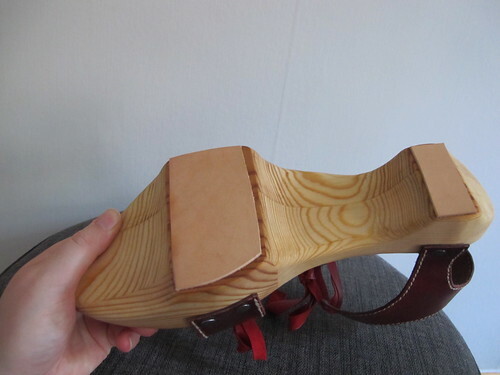 I made these for last years medieval week, my mothers boyfriend helped me to make the basic shape with the band saw and then I had a day of carving and filing to do. 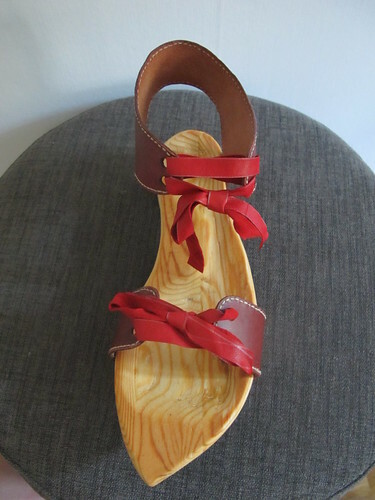 These I made using hand tools, it is funny since my mothers boyfriend did not really believe that I would pull it of, but I am stubborn. 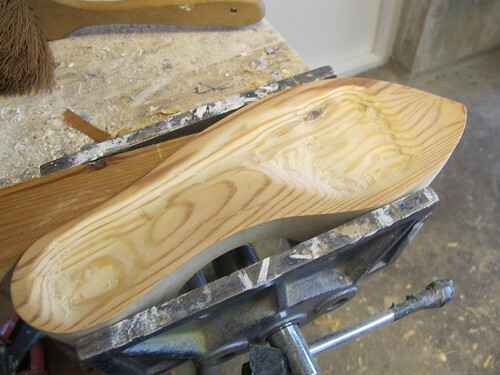 I carved out the sole of the patten, to make it a lot more comfortable. 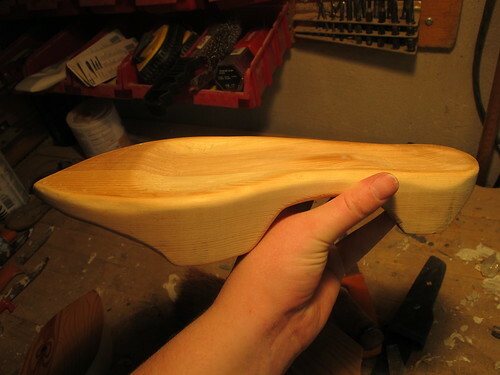 And I smoothed down the edges and then there was a LOT of sanding to do, I wish that I had the help from the belt sander but stubborn me said “well NO, I will use the sandpaper in stead”. 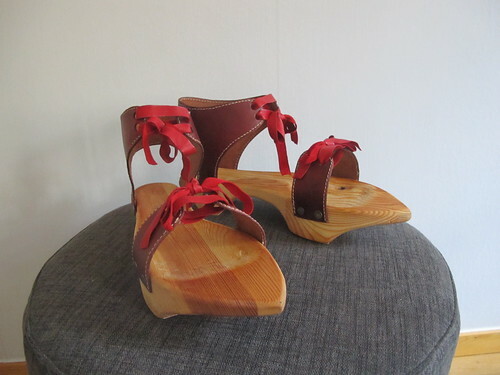 But I love how they turned out, so smooth and nice, I also made some leather fastenings for it that I nailed to the wood. 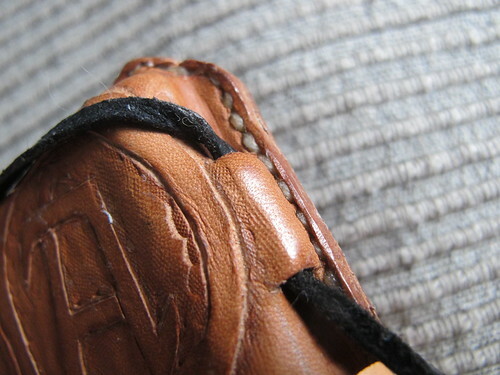 The reason for the stitching is to make the leather not stretch when wet and therefore become to big. 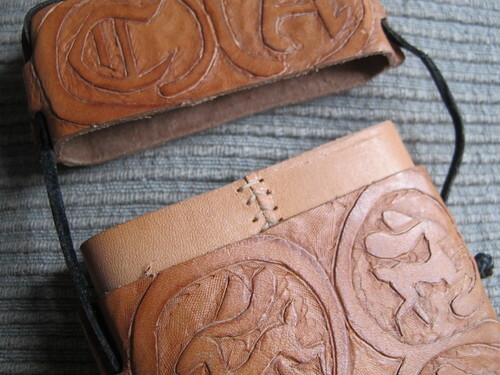 I glued leather to the undersides, to make it more durable. 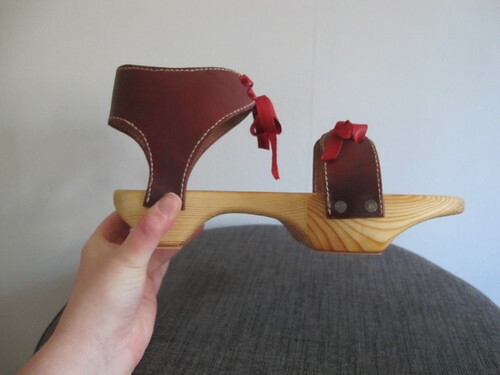 But after walking 10 meters with them the leather just fell of. 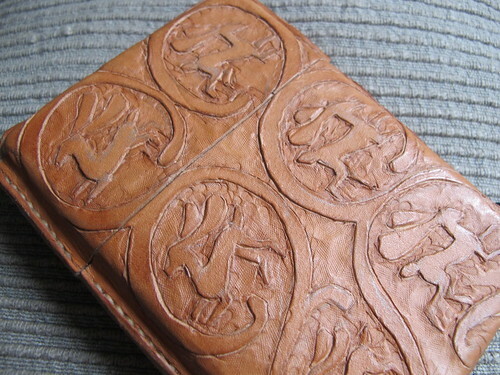 The next year I nailed thicker leather to the underside, that worked better. 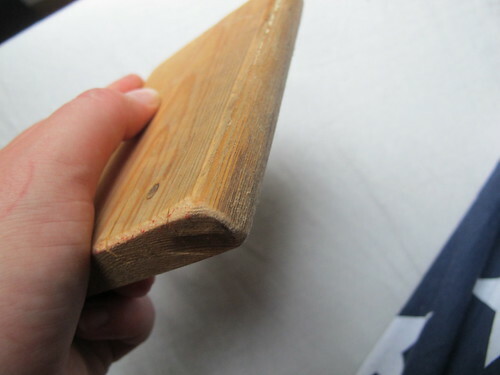 I also used to soft wood, walking with them for few days made me realise this, but I kind of knew this from the beginning. But I was a test to see if I could make them so I was not surprised. But they have lasted this long so I guess I will make new ones when these dies. 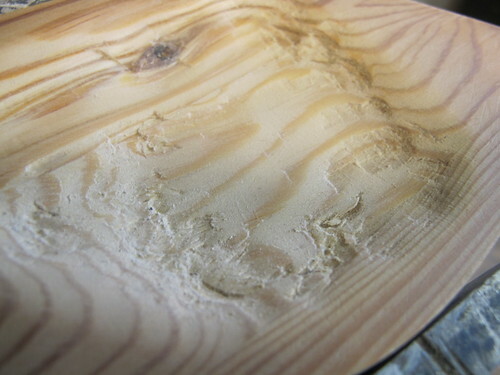 I used my mothers old kitchen table for the pattens, which I believe is pine. 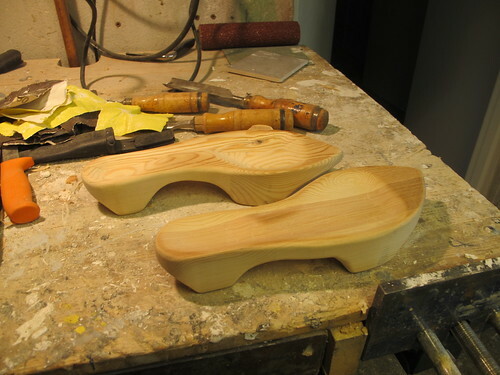 But I have read on other blogs that alder, poplar and willow are better for pattens. 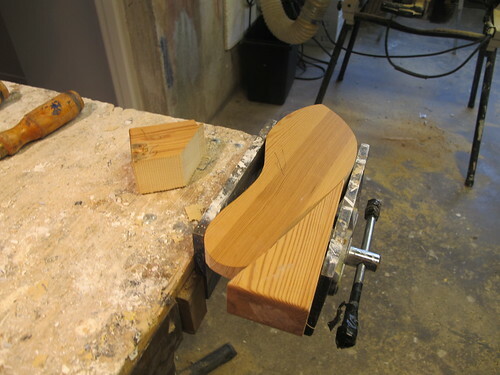 When making them it is really important that the “platforms” ends up right for your feet, so that these is no stopping when taking a step, you need to be able to easily “tip” over in the front. 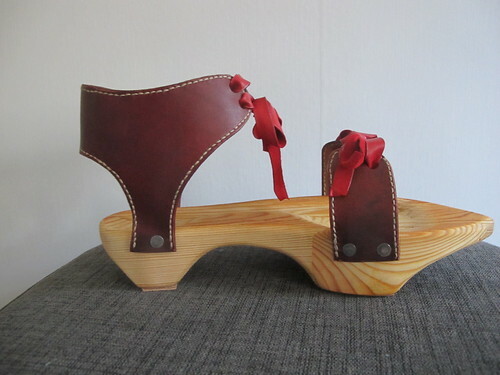 Walking in these makes you feel like a little pony, making the steps echo in the narrow alleys of Visby. 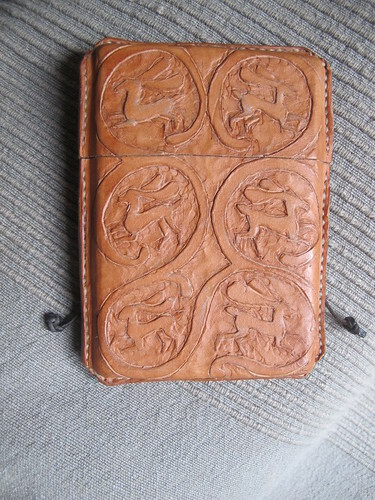 For medieval week I wanted to make a leater case to keep my mobile phone in. It always feels nice that when you open your pilgrim bag you can be sure that nothing modern is seen. 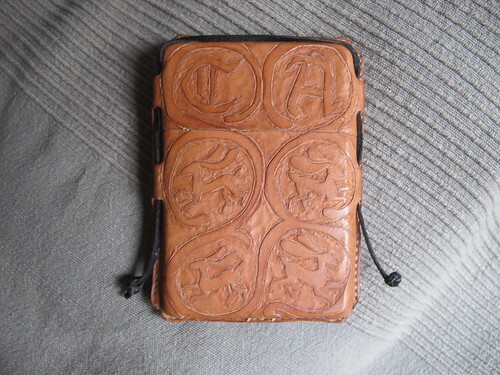 When reading Purses in Pieces by Olaf Goubitz I found a big leather case that was made for wax tablets. 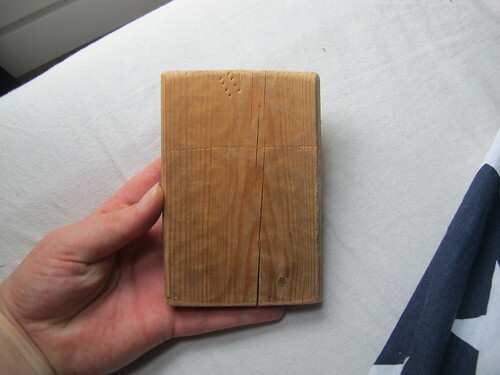 It says in the book that it was probably used by a hunter and it is slightly bigger then the standard wax tablet case. 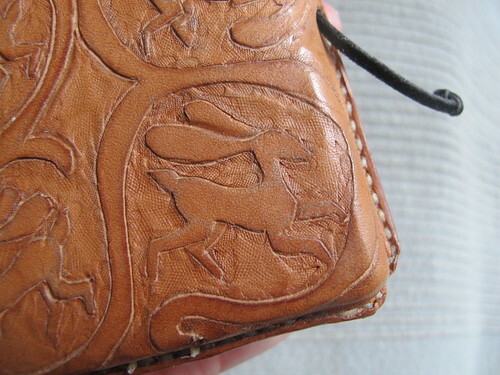 But what caught my interest was the leather tooling, it features dogs hunting hares with floral vines. 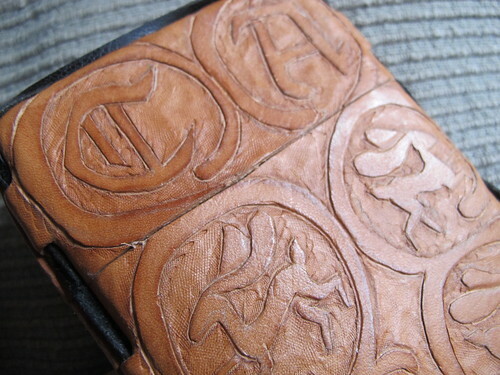 I love hares, so naturally I had to use them on my leather case. 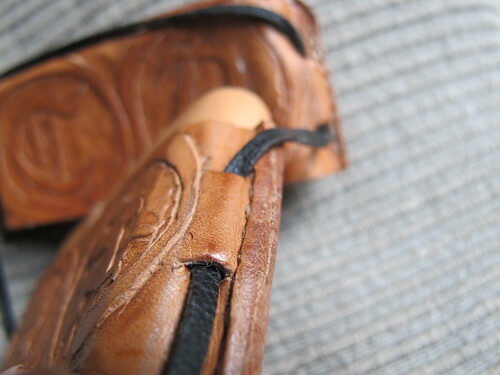 Leather cases were very often adorned with different kinds of leather tooling, all from simple lines to complex pictures. 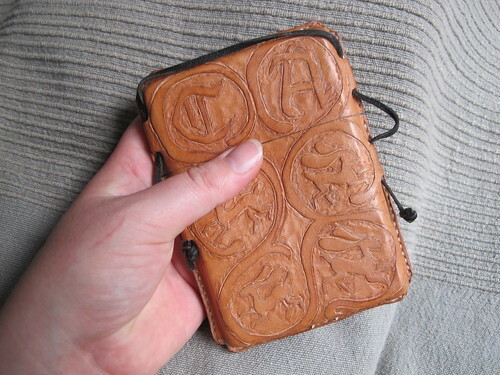 I sewed the leather case when wet around a wooden form, this makes the case nice in shape and the leather tooling is easy. I first drew the pattern before I sewed it and when it was dry, then I cut the pattern with a knife to make it easier to do the tooling. 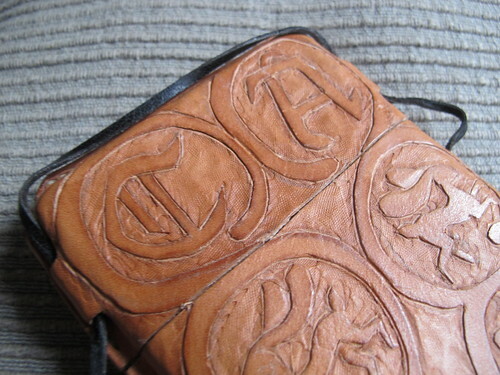 I made my tooling with a leather stamp and I love how clear the tooling is. 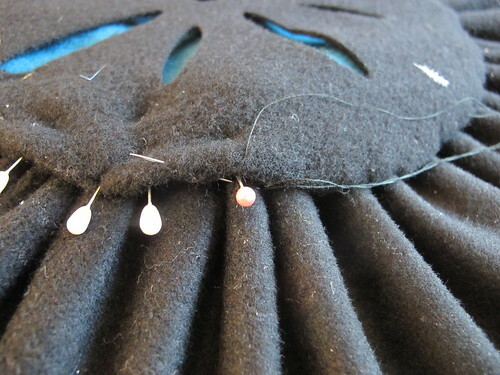 I also made all the holes for the sewing before I let the leather soak in water. 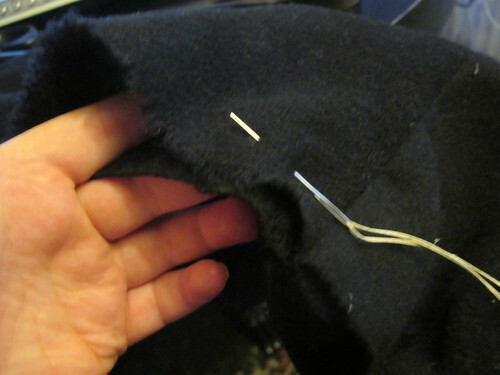 Then It was easy to sew it together, making sure to sew it so that I would not cut the thread of when cutting it open. 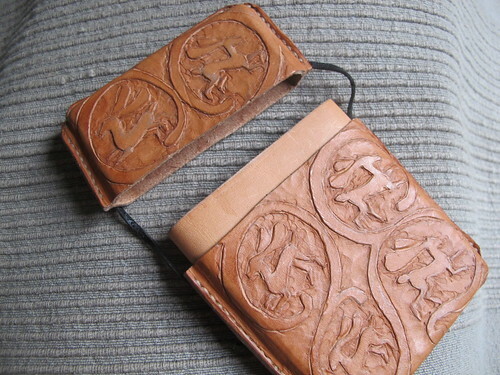 My leather case tooling is inspired by the leather case with the hounds and hares but I only used hares and made my case a lot smaller, the size is about the size that most wax tablets was made in. 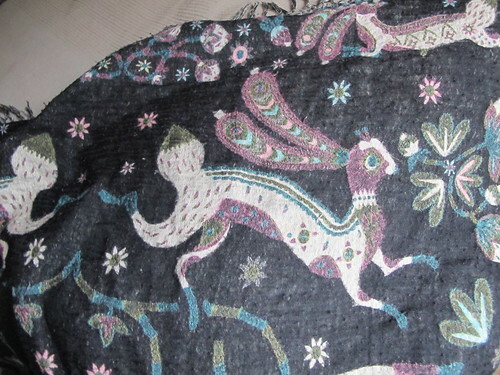 The hares themselves are inspired by my all time favourite designer, Klaus Haapaniemi, I have a scarf designed by him that I love and wear all the time so I picked the shape of my hares from this scarf. I had my phone and also kept some drawing paper and pens in it, as I said, it is nice to keep all none period objects out of sight. 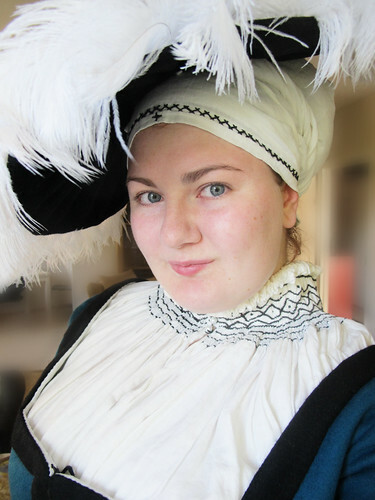 After wearing a dainty little hat with my frau for two years my friends and I decided that this year for medieval week we would make ourselfs new hats, huge hats! 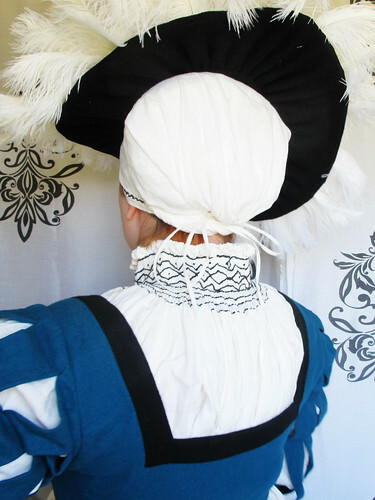 This construction is guesswork, I have no real knowledge on hat making, especially not 16th century hats, but I try, and if it in the end looks looks the paintings that it is nice. 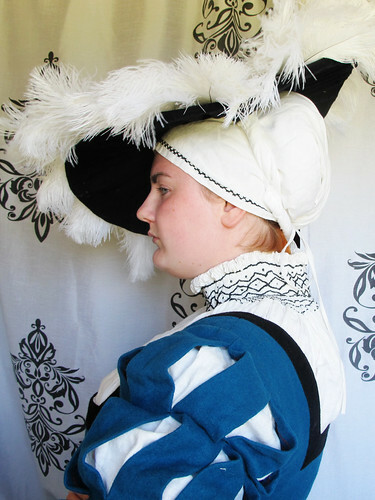 I based my hat on several woodcuts and this style of hat is also worn by the Landsknecht. My small hat is made in the exact same way, but smaller and for that project I bought a big macramé hoop at a second hand store as the base for the hat. 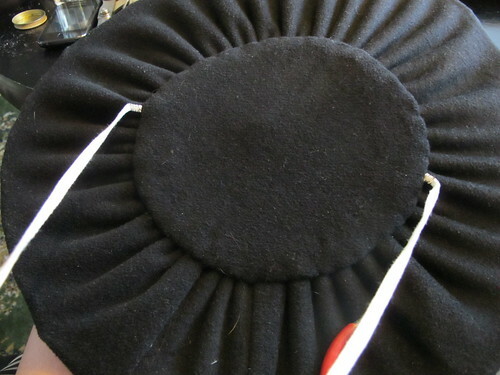 For this hat a bigger hoop of similar type would have been ideal and my first thought was to ask a blacksmith friend of mine to help me to solder a thick wire together. But my friend had to much other things on his list so I was as usual left to my own devices and I started to look at my box of thin wire. I made a hoop skirt out of wire of this type once for a post apocalypse party by twisting lengths together to make a thicker tread and it worked for that so I had to try it. I do like when I can make things myself. 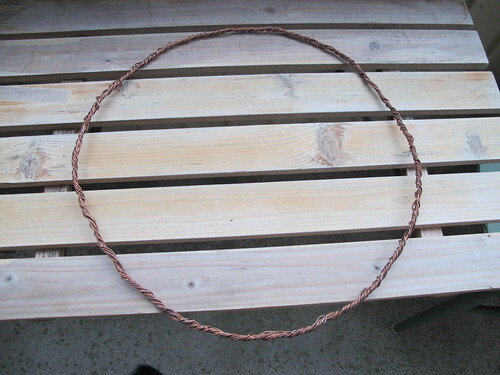 So twisting thin wire together I made a hoop as big as I wanted. 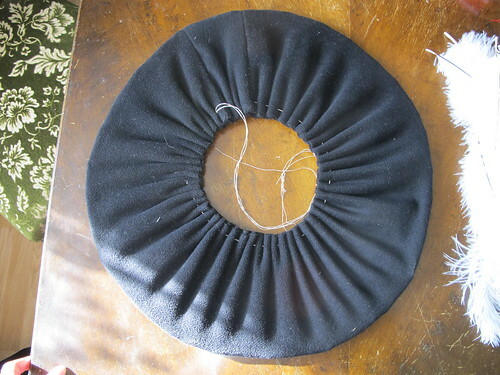 Then I took a piece of wool fabric that when sewn together was slightly smaller then the circumference of the hoop, you want it to sit tight around the hoop. 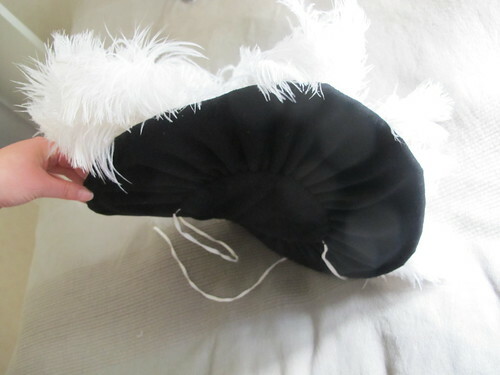 The width of the fabric needs to be shorter then the radius *2 to make it sit on your head and to make the fabric sit tightly in the hoop. 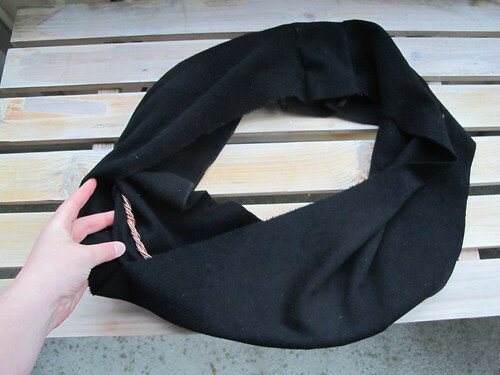 Sew the fabric together, I used scraps so I have sewn it at two places. 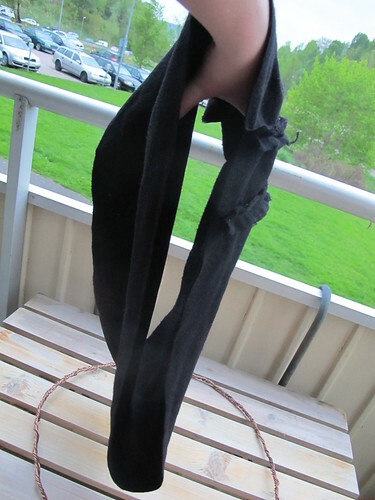 Put the hoop in your fabric tube. 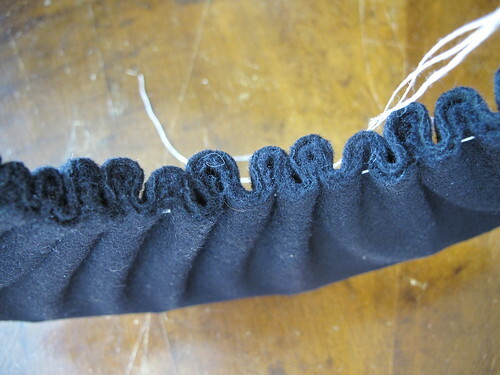 Put the wrong sides of the fabric together and gather the double fabric using a strong thread and big stitches. 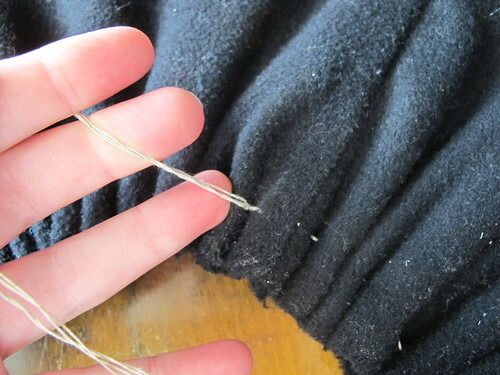 Sew all around the inside of the hoop gathering the fabric and making it sit tightly around the hoop. 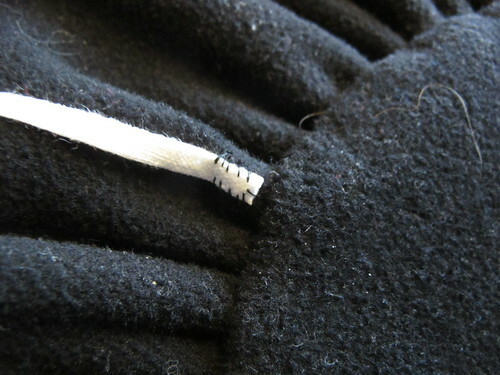 Pull it tight and secure the threads. 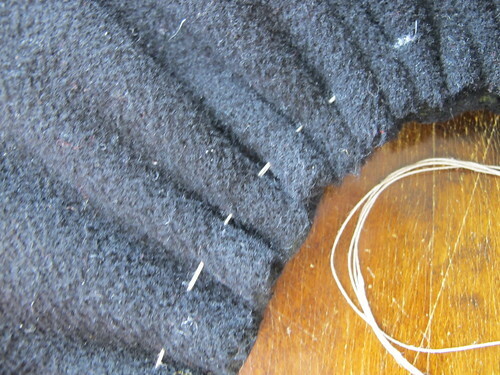 If you use the same length of all your stitches the gathering will look even and nice. 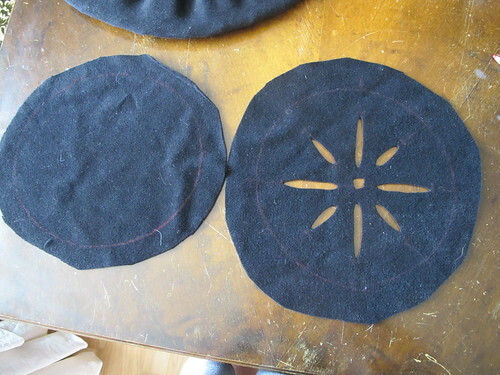 Then cut two circles that covers the hole in the middle, one is for the top of the hat and the other is for the underside. 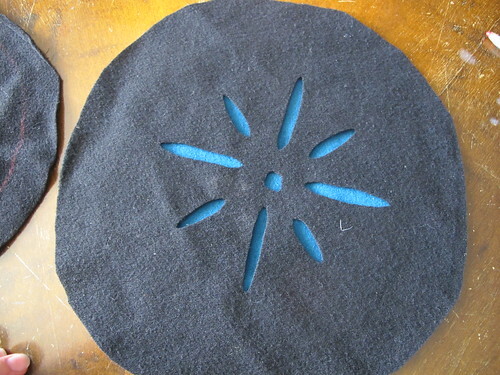 I cut decorative slashes in the top circle, using a wool that matches my dress to put under, I cut the blue wool the size of the finished top circle, this makes it easy to pin the seam allowances under. 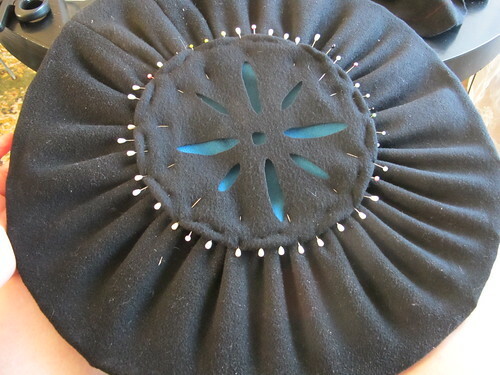 Then I pin the top circle to the hat and sew it with big stitches, one in each “pleat”. Do the same to the underside. Then I attached some linen ties so that I could tie it onto my head. 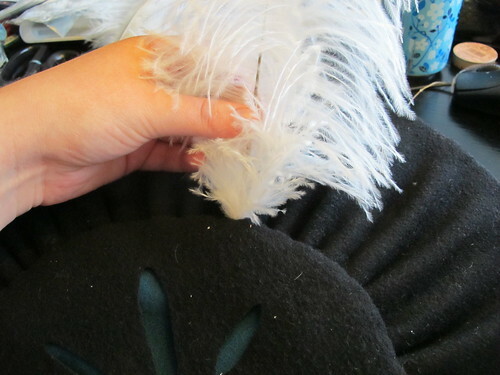 Now it is time for feathers! 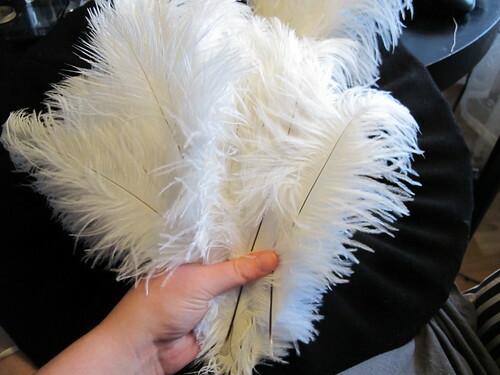 I simply put the feathers into the folds of the pleats. I do not fasten them in any way they stay put anyway. I put them all around my hat. When I was at medieval week a whole bunch of people told me that when they had been at a event in Germany the German re-enactors had told them that the way that most of them wears their feathers, on one side of the hat facing back away from the face was not the way that the German Landsknechte was wearing them but the Swiss Landsknechte, but that the way to wear them was all around the hat, as I have mine or facing forward. 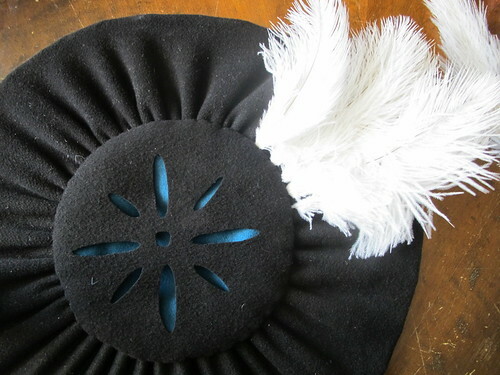 It is always nice to hear that your hat is considered “right”, but then I have based my hat on several woodcuts so I knew that the look was “safe”. If there are any truth to this or if it is just a “myth” I do not know. 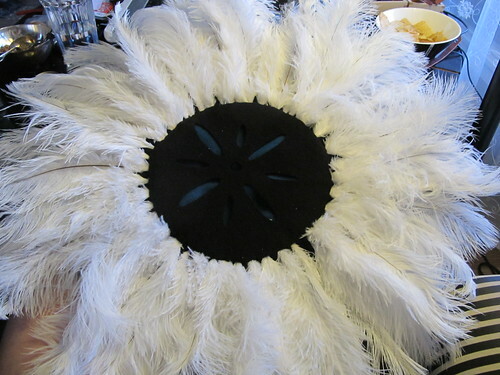 And this is how it turned out, at first I did not know if this hat was for me. It is so big and loud and feathery, but I decided that I kind of liked it and after medieval week I am now sure that I like it!